I Was Featured and You Can Be Too! This has been a SUPER exciting week for me, to say the least. I was stoked (wait?! Does anyone actually say stoked anymore?) thrilled to find out a few of my projects were chosen to be finalists at a couple of big contests going on in the DIY Blogosphere. 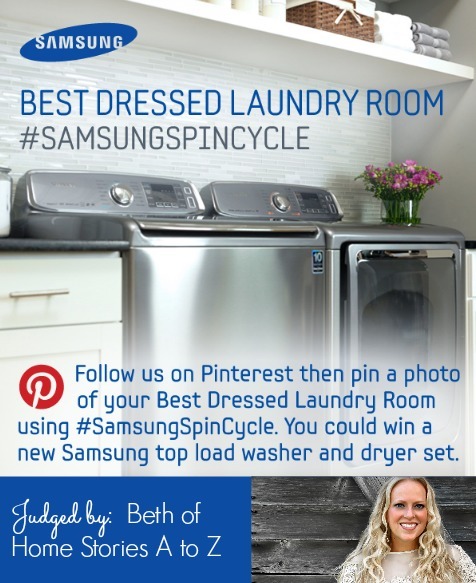 First up, I was over the moon to find out that Beth from Homestories A to Z selected my laundry room as her choice for the Samsung Best Dressed Laundry Room Contest on Pinterest. Next, (and probably my favorite surprise of my whole week whole blogging career) I learned that Brittany from Pretty Handy Girl (oh yes.. the same one from here) selected my kitchen to be a finalist in One Project Closer's The Better Half Before and After DIY Contest (supporting Habitat for Humanity). I won $50 to spend at Home Depot (can I get a whoot whoot? ), $100 was donated to Habitat for Humanity in my name, and I am in the running for the Grand Prize. Plus it is extra special being selected by Brittany since she is one of the reasons I had the guts to tear out the horrific light box and give tiling a shot for the first time. Lastly, my kitchen was selected as one of three "Coolest Family Kitchens" on SheKnows. Now, enough about me.. here is where YOU come in. You too can link up to the Before & After DIY Contest.. It isn't over yet. There are still 3 weeks left and three guest judges (Shaken Together, My Blessed Life and Remodelaholic) will select 3 more finalists. You don't have to be a blogger, you can email your entry in as well. Once again I want to thank Beth, Brittany and Jana from She Knows for selecting my projects. You have no idea how much it means to me!